I saw a string of comments on Facebook yesterday, all from young wives and mothers, about everything they were having to do to get ready for the holidays while their hubbies, for the most part, observed from their thrones. Brought back painful memories of some of my more dramatic pouting sessions in years gone by. If only I’d known then what I know now. It got me to thinking, about a book I picked up a couple of years ago called On Strike for Christmas, by Sheila Roberts. It was about a group of women in a small town who got fed up with killing themselves to create the perfect holiday for their families each year, and getting little to no help or appreciation for their efforts. So, they all banded together to declare a strike, leaving it completely up to the men to make Christmas happen that year. Think you know how this story will end? Think again! Like almost every other woman who picked this book up off the shelf, I was ready to settle in for a good dose of male-bashing, and there was just enough of that to make it funny. But there was also a good dose of introspection–enough to leave me with a guilty conscience. As it turns out, our women’s penchant for perfectionism is at least partially to blame for this yearly stand-off. Thankfully, I’ve finally realized that trying to pull off a perfect Martha Stewart holiday each year will only leave you feeling bitter, exhausted, and lonely. Too bad it took me so long to figure that out. My family still hasn’t come to grips with the new me. Just the other day I heard Dear Daughter exclaim “Mom could never stand not putting up a tree for Christmas. She’d go nuts if she didn’t get to decorate her tree!” They just don’t get it. It was never about the tree. It was about the experience–about trying to recreate that perfect Hallmark moment where everyone is gathered together, stringing popcorn, decorating the tree, sipping hot cocoa, laughing and singing carols. Unfortunately, dragging my family away from computer, TV and video games, and forcing them to participate in tree-trimming, never made for a laughing, singing group. It made for a very grumpy group. But, there were other ways to get the experience I was after. If, for instance, I were to announce to my clan that we were off to the annual outdoor performance of TUBACHRISTMAS, or to stroll a street market, followed by hot chocolate and churros at a favorite cafe, they’d be elbowing each other out-of-the-way! to be first in the car. And so, at last, I can live without a perfectly decorated tree. For, you see, it was never about the tree! Becky Lane has spent most of her life figuring out what it means to be “living the good life.” She and her husband now live on four acres in the Texas Hill Country, in a house called “Seasonality.” She chronicles their transition from big-city-suburbanites to slow-life-practitioners on her blog of the same name. 2010 was the second year in a row, and only the second time in my life, that I sent out Christmas cards. I don’t remember whose idea it was originally, mine or my husband Mike’s, but it was immediately agreed upon as a good one. We also agreed to use an image from our thousands of digital photos. 2009’s choice was a branch from a tree at the end of our street. With a little post-processing, the image flowered into a festive combination of blue sky, red and amber leaves, and spiky balls dangling like ornaments. I enjoyed imagining loved ones receiving our card and smiling. Last year’s card featured me lying on the driveway of our friends’ home in the high desert, a shot taken during one of our many extended stays. 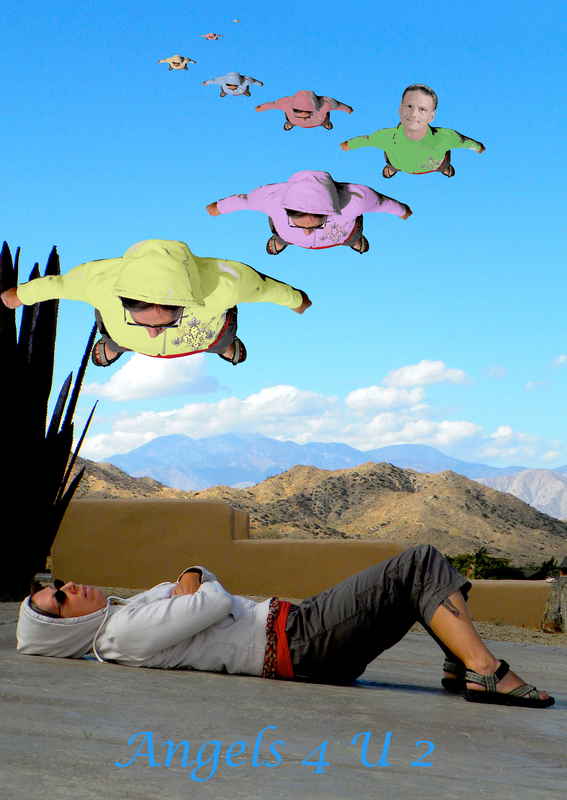 Mike Photo Shopped miniature mes in pastel shades—yellow, pink, green, the colors of a soft desert sky—flying in formation above the recumbent me. He then pasted his grinning face onto one of the flying wives. Thus, another holiday greeting was created, angels delivering love and good wishes, and hopefully eliciting a chuckle. Could it be it that a little more than a year ago we were still walking six miles a day? Or was the branch photo taken during one of our shorter walks, abbreviated because of Mike’s Parkinson’s, to around the block? And how long ago was it that those walks became just to the end of the street with our cat Chico darting from car to tree to bush following after us? 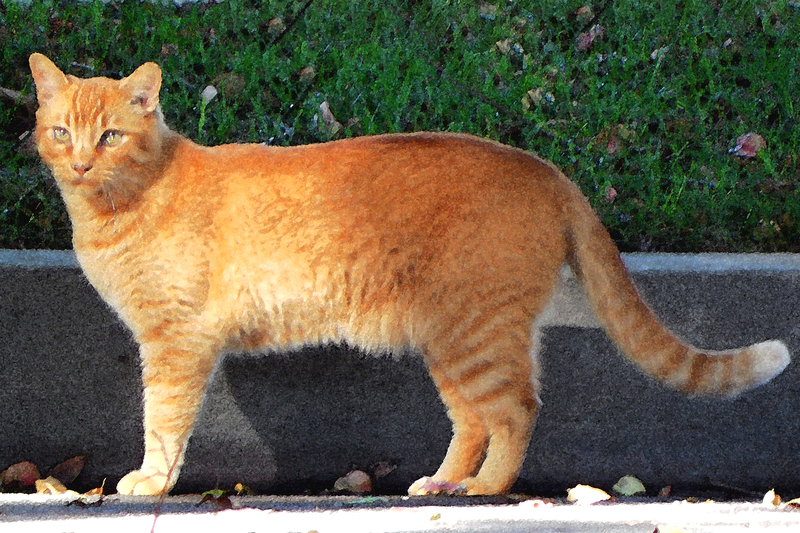 We trained Kittums (only he knows his third name “and will never confess”) to go on these walks, enticing him slowly a few houses at a time, allowing him to find safe havens along the route. Under Sam’s truck. Along June’s hedges. Pressed against our legs, tail anchoring him to his pride. While Mike and I may cover less ground on our feet, we’re still out and about in a big way. Our truck stays loaded with supplies— tents, sleeping bags, Tupperware crates of canned food. We can decide at nine a.m. to hit the road and by noon be setting up camp in Joshua Tree National Park or lunching with friends Stan and Laura at their new casa, in nearby Yucca Valley, which has become our home-away-from-home. Now that the four of us are retired and in love with the desert, we play like kids again, piling into the four-wheeler to investigate the surrounding hills, taking mid-day naps and slow walks down dirt roads, spending an afternoon hour watching quail outside the backyard window, and sipping cocktails at l’heure bleue under the space heater on the patio, spying coyotes lurking among the Joshuas. In addition to being wishes of good will, the cards, like Lakota Winter Counts, record a memorable event from the year. They are souvenirs not from foreign places, but from the familiar places of our lives. Memento vitae. Andrea Savee lives in Lakewood, California with her husband, Mike, and their cat, Chico. 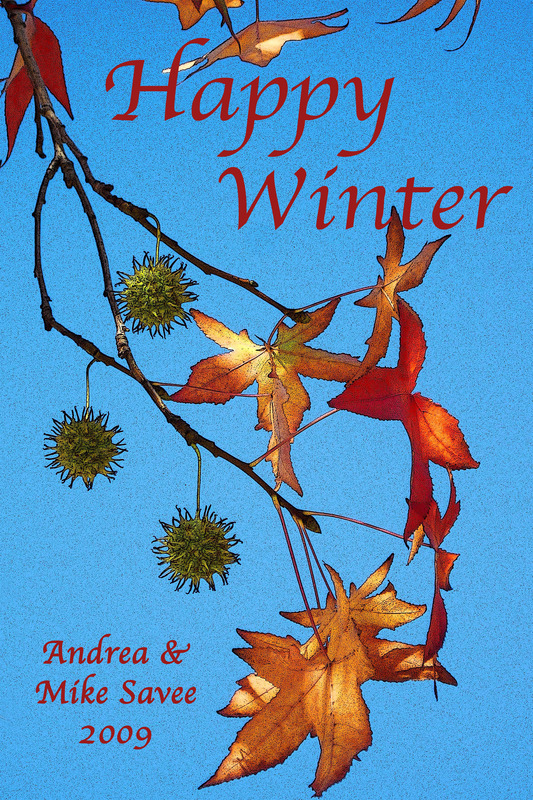 Retired from a career in business, Andrea enjoys traveling and writing. 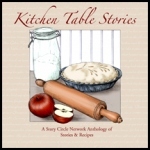 Her work has appeared in SCN journals and anthologies.